NASA's Opportunity Mars rover, which landed on the Red Planet in 2004, now holds the off-Earth roving distance record after accruing 25 miles (40 kilometers) of driving. The previous record was held by the Soviet Union's Lunokhod 2 rover. "Opportunity has driven farther than any other wheeled vehicle on another world," said Mars Exploration Rover Project Manager John Callas, of NASA's Jet Propulsion Laboratory in Pasadena, California. "This is so remarkable considering Opportunity was intended to drive about one kilometer and was never designed for distance. But what is really important is not how many miles the rover has racked up, but how much exploration and discovery we have accomplished over that distance." A drive of 157 feet (48 meters) on July 27 put Opportunity's total odometry at 25.01 miles (40.25 kilometers). This month's driving brought the rover southward along the western rim of Endeavour Crater. The rover had driven more than 20 miles (32 kilometers) before arriving at Endeavour Crater in 2011, where it has examined outcrops on the crater's rim containing clay and sulfate-bearing minerals. The sites are yielding evidence of ancient environments with less acidic water than those examined at Opportunity's landing site. If the rover can continue to operate the distance of a marathon -- 26.2 miles (about 42.2 kilometers) -- it will approach the next major investigation site mission scientists have dubbed "Marathon Valley." Observations from spacecraft orbiting Mars suggest several clay minerals are exposed close together at this valley site, surrounded by steep slopes where the relationships among different layers may be evident. The Russian Lunokhod 2 rover, a successor to the first Lunokhod mission in 1970, landed on Earth's moon on Jan. 15, 1973, where it drove about 24.2 miles (39 kilometers) in less than five months, according to calculations recently made using images from NASA's Lunar Reconnaissance Orbiter (LRO) cameras that reveal Lunokhod 2's tracks. Irina Karachevtseva at Moscow State University of Geodesy and Cartography's Extraterrestrial Laboratory in Russia, Brad Jolliff of Washington University in St. Louis, Tim Parker of JPL, and others collaborated to verify the map-based methods for computing distances are comparable for Lunokhod-2 and Opportunity. 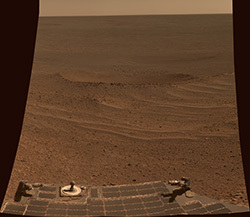 "The Lunokhod missions still stand as two signature accomplishments of what I think of as the first golden age of planetary exploration, the 1960s and '70s," said Steve Squyres of Cornell University in Ithaca, New York, and principal investigator for NASA's twin Mars rovers, Opportunity and Spirit. "We're in a second golden age now, and what we've tried to do on Mars with Spirit and Opportunity has been very much inspired by the accomplishments of the Lunokhod team on the moon so many years ago. It has been a real honor to follow in their historical wheel tracks." As Opportunity neared the mileage record earlier this year, the rover team chose the name Lunokhod 2 for a crater about 20 feet (6 meters) in diameter on the outer slope of Endeavour's rim on Mars. The Mars Exploration Rover Project is one element of NASA's ongoing and future Mars missions preparing for a human mission to the planet in the 2030s. JPL manages the project for NASA's Science Mission Directorate in Washington. NASA's Goddard Space Flight Center, in Greenbelt, Maryland, manages LRO for the Science Mission Directorate.